As part of our local homeschool group, us parents are expected to volunteer at least once during the year. So, I decided to organize a “State Geography Fair” for our group. 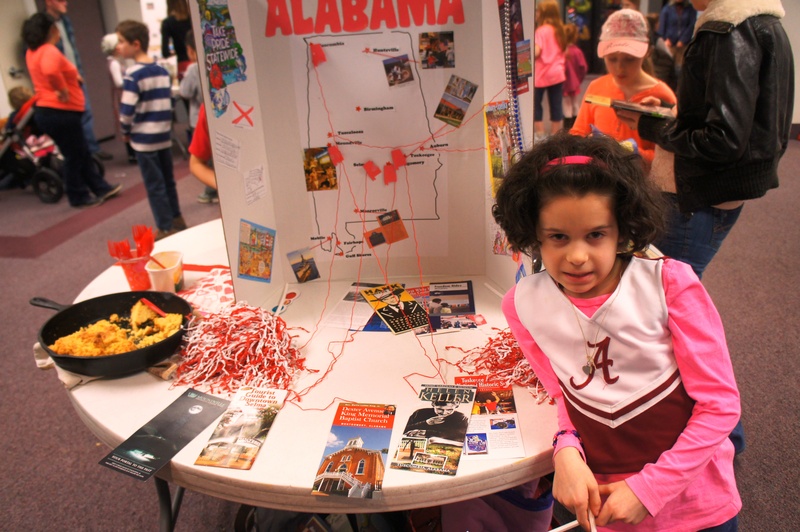 Each family chose a state to learn about and share during the event. This is great fun, educational, and can be as wildly creative as you would like! As a plus, this fits in perfectly with our MFW Adventures study this year – studying US History and Geography! We chose Alabama, since that is our “home” state. 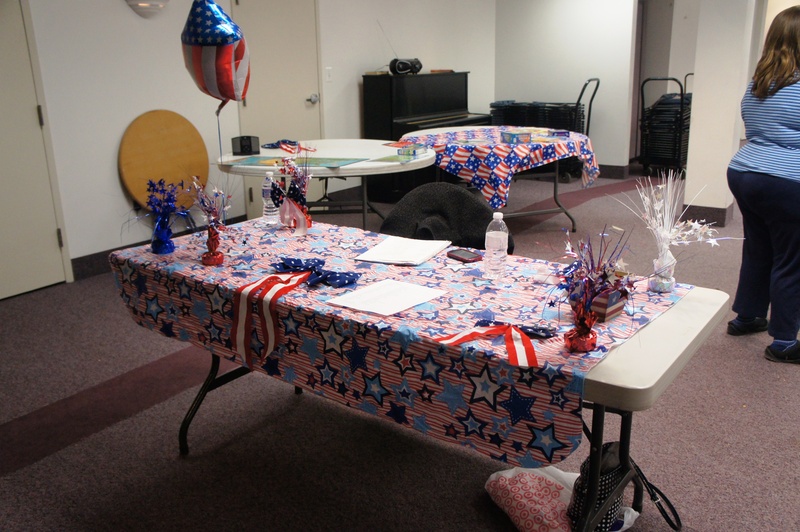 Our “Welcome” Table – Decorated with 4th of July Decorations! 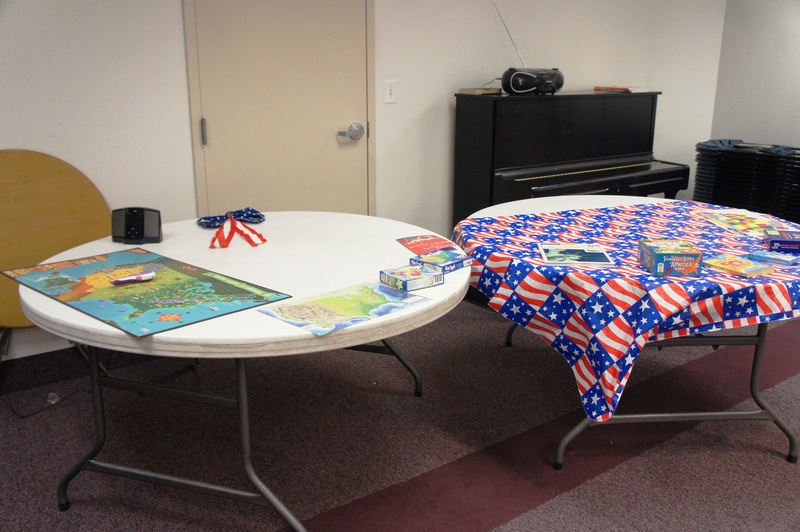 We set out anything USA we might have at home – puzzles, Leapster interactive maps (my favorite), US geography games, etc. These were to entertain kids if they got bored. It worked! We made my grandmother’s cornbread (but gluten-free version) complete with a cast-iron skillet, and bacon grease. Needless to say, we didn’t have much left over to take home! Roll Tide, by the way! Organizing this event was super easy. Beyond booking the room, the majority of the work was just keeping track of which family was doing what (trying to avoid duplicates). And sending out an occasional encouraging email to keep them on track. It was great! Tri-Fold Display Boards – If you want/need these, I found some VERY CHEAP at the Dollar Store! 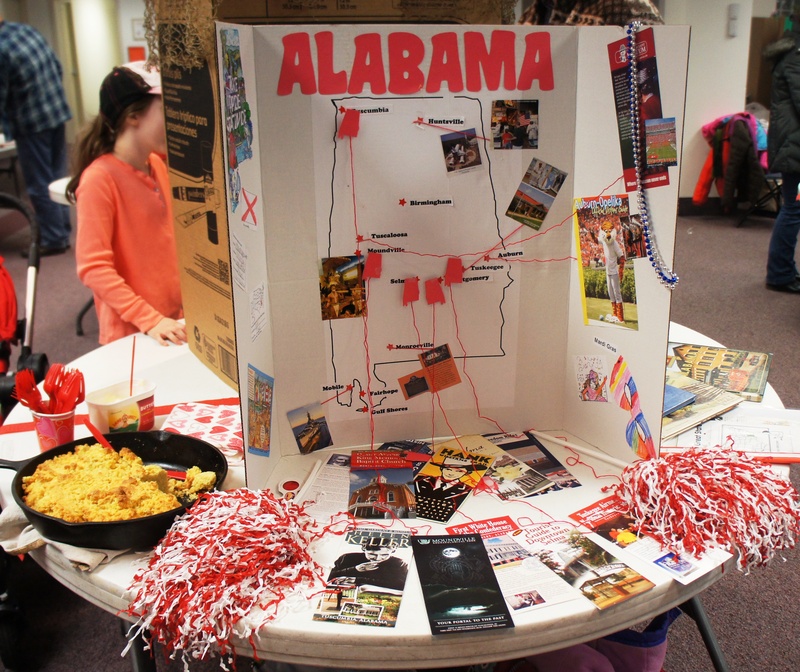 There are tons of ideas you can use to learn about your particular state! The library, Internet, state senators, and more. I’ve seen great items in the Target Dollar Spot section in the past! Maps – Learn about the topography of the state. Postcards – Perhaps write different people from the state and get them to send you postcards from different areas, telling you about their home town. What’s it like to live there? Flat Stanley – might be a fun project for this! History – Any particularly important historical events connected with the state? Food – Is the state famous for any particular foods? Animals and Plants – What are the state plants or animals? 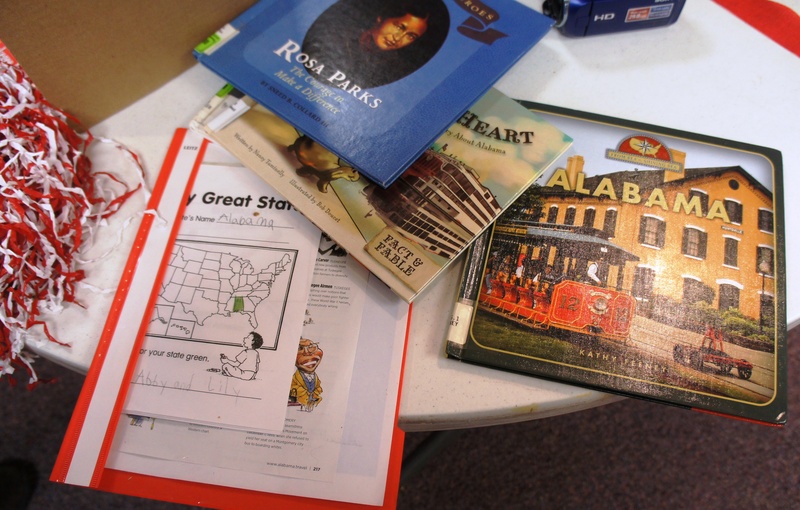 Here are a few online resources that I have personally found – obviously mine tend to skew toward the elementary years, since that is what I have. Here are part of the instructions I sent out – perhaps this will help you with ideas for your own group event! Please create a display and have your children ready to talk about the state (in an informal capacity) to those who come around and visit your “booth.” Think colorful, educational, interactive, and fun! You are more than welcome to tailor your child’s educational experience to your child’s age and ability. But also remember that those visiting will be of various ages. Of course we can all learn something from any age group – but it might be a good idea to have your child practice talking about their state before they arrive. Maybe even practice some things that younger/less advanced kids might want to know, verses older/more advanced kids (and adults). Just a thought we wanted to throw out there! 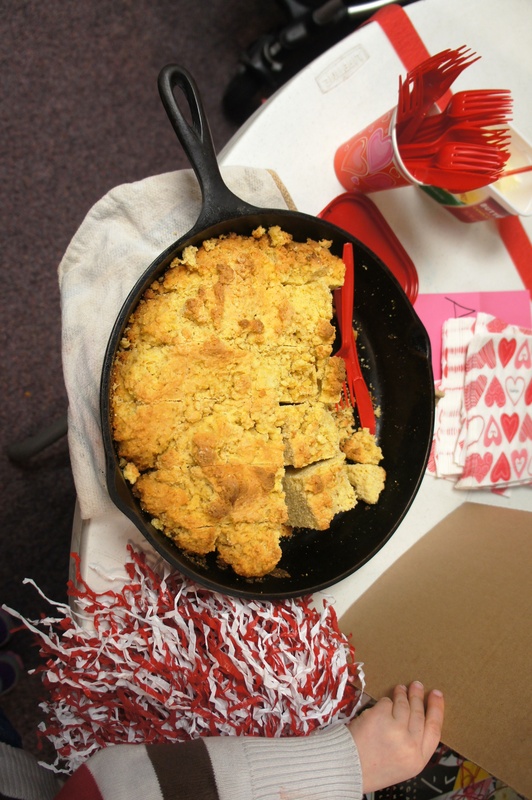 If you choose to have a food item to represent your state, please have plenty to share! Please make sure it is labeled carefully with any known allergic ingredients. Also, if you are going to need to plug something in, please let us know WAY in advance, and bring your own power strip. But also know that we can’t necessarily guarantee we can accommodate. We will try! Also, please be responsible for any items you might need to serve that food, plates, napkins, plastic silverware, etc. That looks like so much fun AND you make it look easy enough that I want to try it! Thanks for the great ideas! Thanks Michelle! It really did end up being pretty easy! I shared your post with my co-op. I think we are going to try it this fall! I’ll let you know how it goes – and I’ll post pictures on my blog too.